Val is Now Available for Motivational Speaking, Interviews and Television Appearances! Val loves to delight, inspire and teach animal lovers how to improve their relationships with animals! Who is Val Heart and Why Should You Have Her On Your Show? 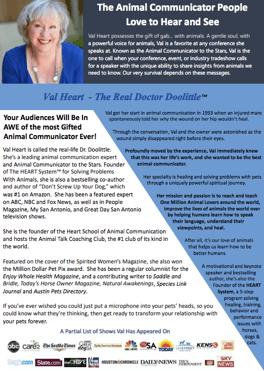 Val Heart is called the Real Dr. Doolittle, a leading animal communication expert and Animal Communicator to the Stars. Founder of The HEART System™ for Solving Problems With Animals, she is also a bestselling co-author and author of “Don’t Screw Up Your Dog,” which was #1 in its category. She has been a featured expert on ABC, NBC and Fox News, as well as in People Magazine, My San Antonio, and Great Day San Antonio television shows. 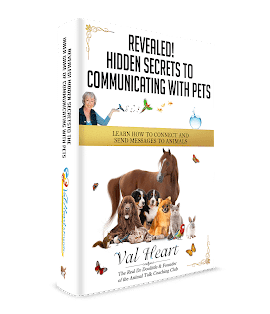 She is the founder of the Heart School of Animal Communication and hosts the Animal Talk Coaching Club, the best club of it’s kind in the world. Featured on the cover of the Spirited Women’s Magazine, she also won the Million Dollar Pet Pix award. She has been a regular columnist for the Enjoy Whole Health Magazine, and a contributing writer to Saddle and Bridle, Today’s Horse Owner Magazine, Natural Awakenings, Species Link Journal and Austin Pets Directory. If you’ve ever wished you could just put a microphone into your pets’ heads so you could know what they’re thinking, then get ready to transform your relationship with your pets forever. * A personal note from Carmen after the show: “We thought you would want to know — this is so amazing! You remember how much trouble we had with our puppy, Texas,barking uncontrollably? Well, the very next Saturday morning, Texas was in his kennel in the front of the house with the door open and he was lying in his bed. John was at the computer in the same room when the Fed-X guy knocked on the door. Winner of www.MillionDollarPetPic.com Excellence Award! Check out Val’s interview with Marketing MAX of MillionDollarPetPix.com which introduced people to her and her work as a Master Healer and Professional Animal Communicator. The interview is about half an hour long and very interesting to those wanting a better understanding of how she can help people and their pets. MillionDollarPetPix.com is a new family-friendly pet website where you can “make your pet a Star” in their 10-year Internet time capsule. It is a content rich site that has something for every age, from a Kids Space to Ask a Specialist.